Utilize our Marketing Team to gain credibility for you and your company with the free marketing video below. We will customize it with your own logo and tagline. So What Do I need to Do to Get the Free Marketing Video? All you need to do is signup for your free 7 day trial of iFALLCEPT through Apple’s App Store. Even if you don’t keep the APP and cancel within the 7 days, you still get to use and promote your service. So what do you have to loose? NOTHING! If you like it, you keep it. If you don’t, then you got a FREE Marketing Video and Marketing Training with no strings attached. Click HERE > to download app from the Apple Store if you are a company of 1, you qualify for our Professional Edition. So What Am I Really Getting with the APP? iFALLCEPT is the most comprehensive room by room APP available on the market. You can download this sample report by clicking here. The report allows you and your client to explain and understand why fall safety is so important. It also guarantees that each room is given full attention and your staff will provide the very best comprehensive analysis for your clients without missing or forgetting to check crucial fall hazards. Additionally, reporting hazards in the home can be a sensitive subject to seniors, iFALLCEPT allows you or your employees the ability to make recommendations in a supportive, informative, and non-confrontational way. In addition to falls, Seniors are at 4x more susceptible to fire deaths. Which is why we also have a Fire Awareness Program included for FREE, You can download this sample report by clicking here. As apart of the program you will also have FREE downloads to provide to your clients, giving MORE value than ever before. 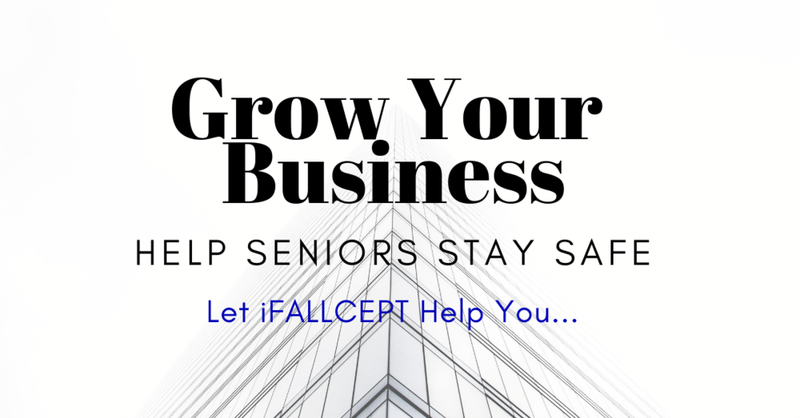 So What are the Exact Steps I Need to Do to Get Started and Get More Business Using iFALLCEPT? 1.) Check us out on the Apple Store and Download us for your free 7 day trial today! Include your email you signed up with so we can validate your subscription. In the email include your company logo (png format), website and phone number for your very own customized marketing video. 3.) We will send you your marketing video. 4.) We will provide you FREE access to our Members Only marketing training site. A Senior dies every 20 minutes from a fall and we all want to change that number. We are here to help you in your business, and help you change lives. So DOWNLOAD NOW and Let’s Get Started!